I can’t believe I did an entire year of food blogs last year and never mentioned whoopie pies, other than to note that I’d swim through crocodile-infested water to get one. So this is long-overdue. I read an article once, claiming that whoopie pies came from some town in upstate New York. This is a lie. Whoopie pies are Pennsylvania Dutch from the top of their over-the-top chocolate cookie-cake to the bottom of their sweet fluffy filling. Only the Pennsylvania Dutch would make a cookie with this much chocolate and sugar, then decide it should be stuck to another cookie with more sugar, whipped into a roux, like some bizarre sweet gravy. Nobody else would then decide that this cookie should be made in vast quantities and provide a recipe that used six cups of flour. 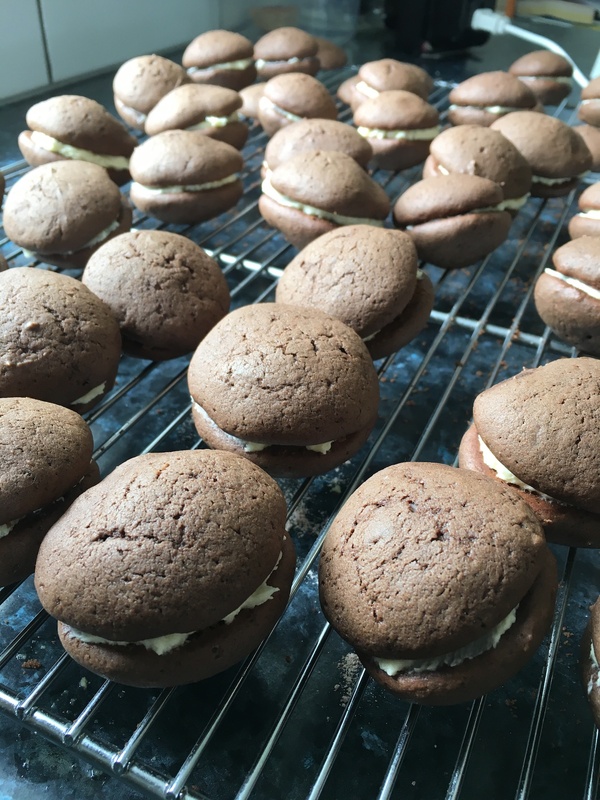 Growing up, whoopie pies were the cookie for bake sales. They were a summer cookie. A cookie for farmers’ markets and family picnics. They were one of the things I missed when I left home and moved to the whoopie-pie-less Midwest. And so, here, without further ado is the whoopie pie recipe my mother gave me when I left home. I admit that, these days, I make a half batch unless I’m making them for an event. Cream sugar and shortening. Add eggs and beat. Add sour milk and vanilla. Sift flour, cocoa and salt. Add to first mixture. Add water and soda. Drop by teaspoonful on [greased] cookie sheet and bake 8-10 minutes at 375°F. Cool and fill with filling. Cook flour and milk together until thick. Cool thoroughly. Cream shortening and sugar. Add vanilla and flour mixture, beating until the consistency of whipped cream. Put two cookies together with filling.